Now you can use your SBI International Debit card on PayPal and International websites to make payment online. Yes, SBI International Debit cards now support PayPal and International transactions. You can link your SBI Classic, Global, Gold & Platinum International Debit cards with paypal and also you can use at authorized websites. To use your SBI Debit Card for International transactions, first you need to activate International usage and e-commerce usage for your SBI Debit Card. Today we will tell you how you can enable International usage for your SBI Debit Card in different ways. After enabling International usage for your SBI Debit Card, you can use your Card at International ATMs and also use your card for online purchases. Follow these 4 methods to activate International and e-commerce usage. 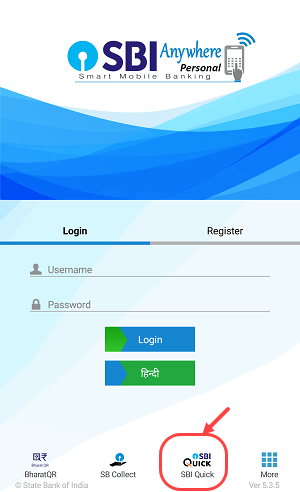 State Bank Anywhere is one of the best mobile banking application for SBI customers. You can access online banking services like fund transfer, recharges, check balance, Debit card services and much more. Let’s see how to enable International usage for your Debit Card on State bank Anywhere. 1: First of all you have to log in on SBI Anywhere. After logging in, tap and open Services and next tap on Manage Debit Card. 2: And next screen, select your Account number and Debit Card number. Now turn on International usage and e-commerce (CNP) txns and submit. E-commerce (CNP) txns: To make an international online payment, you need to turn on this option. This facility is also available for you on Internet Banking. First, you have to go to https://www.onlinesbi.com and log in. After logging in, click and open e-Services and then click on ATM Card Services. Next screen, click on ATM Card Limit/Channel/Usage Change. 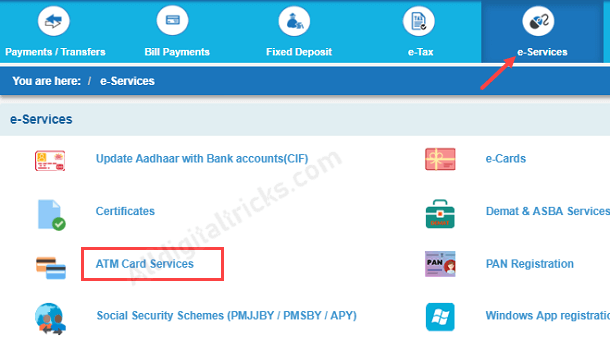 Now select your Debit card number and in Services, select Change Usage Type. In usage type, select International Usage and select Enable International Usage. 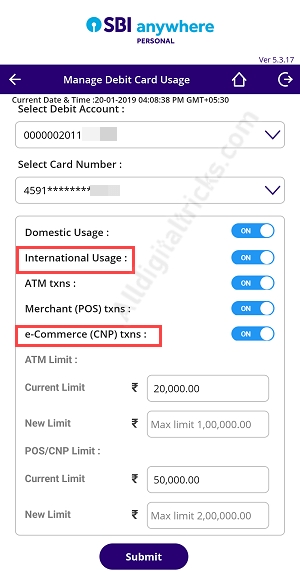 For online transactions, you also need to change Channel type, select CNP Channel and Enable it. The third option SBI Quick Banking. 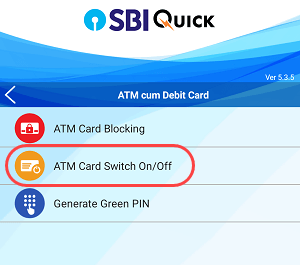 SBI Quick is now part of the State Bank Anywhere. You can use this facility on SBI Anywhere. If you do not have internet banking facility then you can choose SBI Quick to enable International usage for your debit card. 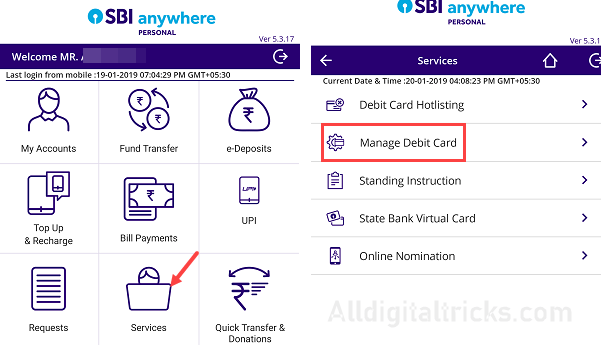 First Install SBI Anywhere and open the application after installing. 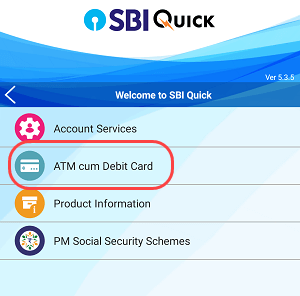 After opening SBI Anywhere, you can see the SBI Quick Option. Tap and open it. 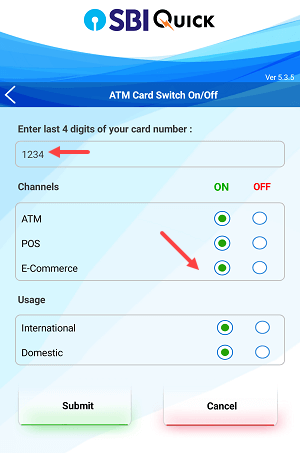 Next screen just type the last 4-digit number of your card and turn ON all options. After selecting ON for all the options, submit it. If your phone has enough balance then Message will be sent successfully and you will receive a success message. You can also send the following SMS to activate/deactivate International usage and other usages for your SBI Debit Card. Send an SMS from your registered mobile number. So in this way you can enable International usage for your SBI Debit Card. How much time will take to enabling services? Tried these steps but it’s still not working. It works. Which Debit card are you using?? Your card is International?? No need to visit bank. You can done this at SBI Anywhere. can i access international usage for SBI Classic Debit card ? Yes classic International Debit card works fine on paypal and other sites too except some websites. sbi dont work on aliexpress? Which card are you using?? Hi the message format is not correct, I got an error message afterwards by sbi!!! classic debit cards are not international debit card so if yu enable all this it will not work got it. Global, Platinum, Gold International Debit card works on paypal and many trusted websites. whether activating international service lead to any charges? No charges levied by bank. Exchange rate applicable for International transaction. When you pay through Paypal, they take some charges. Overall charges are not much when you do international transaction. For some website SBI debit card not working. it works Only selected and trusted website. If you really want international debit card then open 811 kotak account, it is zero balance account and apply debit card. We just got the card. So, only when we need to do an international transaction, we need to enable it or we can just do it now? Whenever you need to use card for International usage, just open SBI Anywhere and enable Int. usage and CNP usage. Although I enabled all the options as shown above for SBI Anywhere, I am not able to make an international payment through SBI Global debit card. The message reads, Txn declined because your debit card is domestic, upgrade it to international. Plz help!! Thank you soo much I got messages instantly. Hope it works. please note SBI International debit card works only those sites where OTP support available. When you make payment , an OTP received on your reg. mobile. If that site support OTP then you can make payment. Tried all the above. even visited the branch they asked me to right an application and still haven’t received reply from them. any other advice?? i need pay my application fee to a canadian university. Can i use sbi global master card for this? Hello plz note SBI international debit card works well on limited website so please try. If paypal option available then try Paypal that link with debit card. Kotak 811 debit card work well. It is zero balance saving account and virtual debit card. So i suggest go for it.